Compact equipment with two grades of outfit for gentle and efficient removing of printing plates and double sided adhesive tape layer from the sleeves. 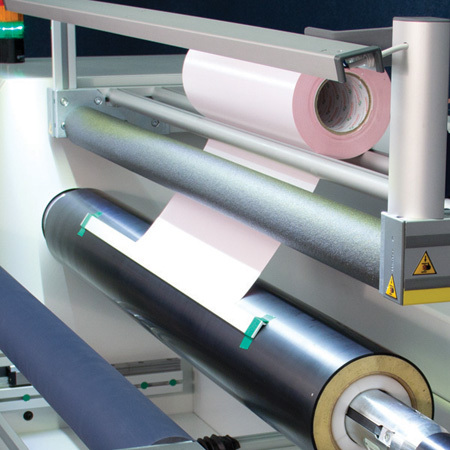 Master especially for the printing houses where the high mounting capacity and protecting the printing plates from damages are equally important. We have two differently equipped Master models in our range to serve the highest demands and to offer the best value for the money. The used printing plates often damage and/or elongate while removing from the adhesive tape layer and the print will not be as perfect as before using a plate like this. Further problem that some operations of the plate mounting process, like the aforementioned plate removing and the adhesive tape applying just reserve the mounting machine time reducing its efficiency. These operations could be done separately on Master DM or DMT machine. Using the Master, the most time-consuming operations are removed from the mounting machine and this way you can increase the plate mounting capacity many times over. 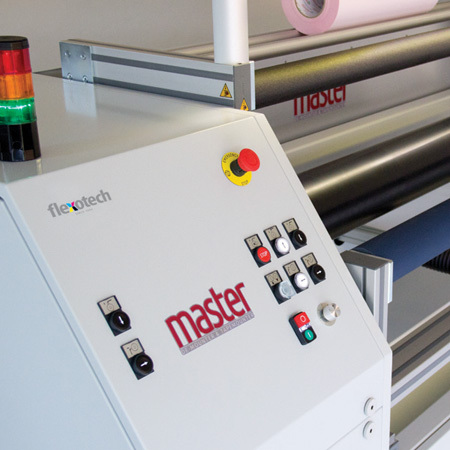 We offer the Master especially for the printing houses where the high mounting capacity and protecting the printing plates from damages is equally important. We have two differently equipped Master models in our range to serve the highest demands and to offer the best value for money. 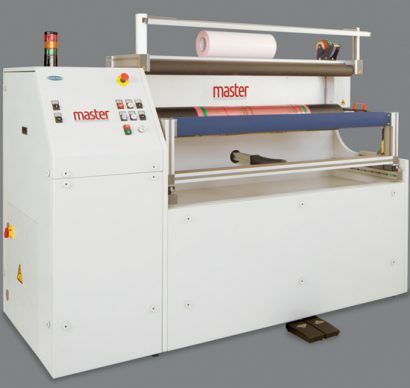 This model includes an additional pneumatic tape applicator roll and a tape roll holder allowing fast and precise application of the double sided adhesive tape onto the sleeve from roll ahead or crosswise by hand. You can choose other options to this model from the list in our offer. The base model is suitable to remove printing plates and also adhesive tape from the sleeves gently. 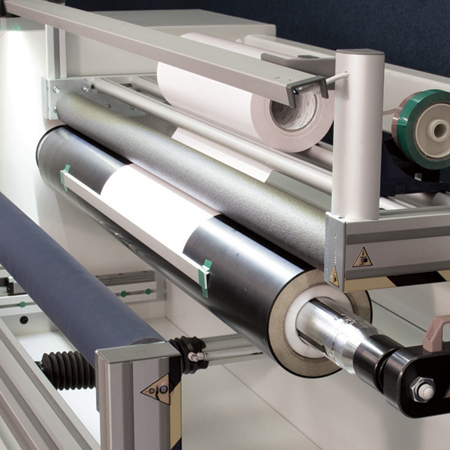 The stability of the machine is ensured by the robust sidewalls and thick-wall steel crossbeams – this construction is already well-tried in our FlexoTech tape mounters. There are electro pneumatic and electric motor driven units built in the machine moving on precise linear rails providing fast and comfortable operation. Continuous variable rotation of the built-in air shaft and high brightness LED light lines lit ergonomic work area are provided as well (only DMT model). The safety devices ensure safe working zone for the machine operator. The machine has simple, maintenance-free and reliable electronics. For gentle demounting the adhesive tape and the printing plate. Pneumatically moved roll with soft (20 Shore) covering, led on precise linear path. 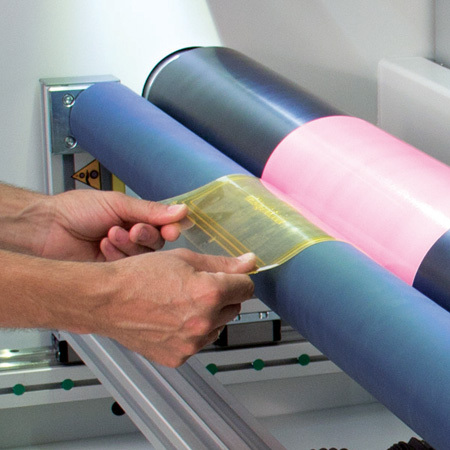 The 90 mm diameter pressure roll coated by 10 mm thick rubber ensures gentle removing of the printing plate and the double sided adhesive tape – or both of them together – from the sleeve. 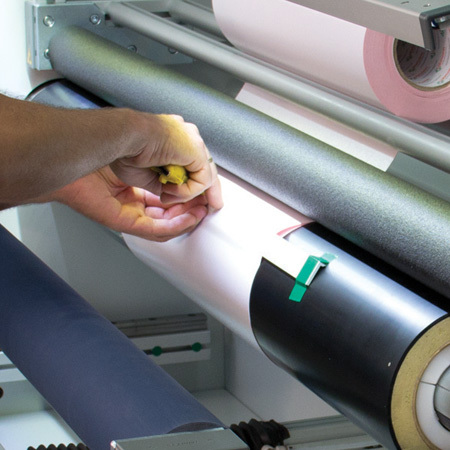 The pressure roll prevents deformation and elongation of the printing plate and its soft rubber coating protects the photopolymer also from other damages during the removing. Sleeve arm unit built in a robust steel housing for the stable guiding of the air shaft. 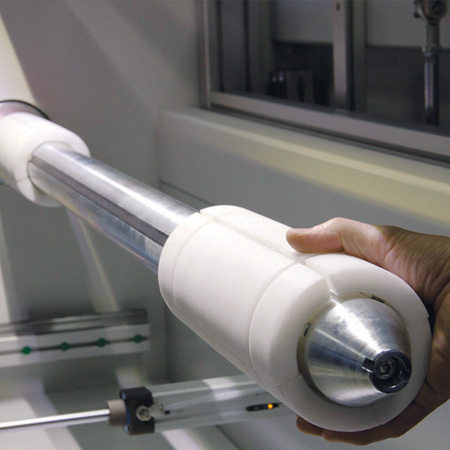 Pneumatic power cylinders are fixing and releasing the sleeve arm in closed position. Manual opening and closing of the sleeve arm. Custom made air shaft able to receive the smallest size sleeve of the printing house. Able to receive other sizes (inner diameter, ID) of sleeves as well using optionally available adapter sleeves. The shape of the air shaft allows receiving sleeves with different face width within the nominal size. High torque electric motor provides two direction rotations for the built-in air shaft by timing belt connection. The rotation is activated by two foot pedals. Both hands of the operator is free while rotation is on. The air shaft is manually turnable if the electric motor is in inactive condition thanks to the electromechanical clutch device. 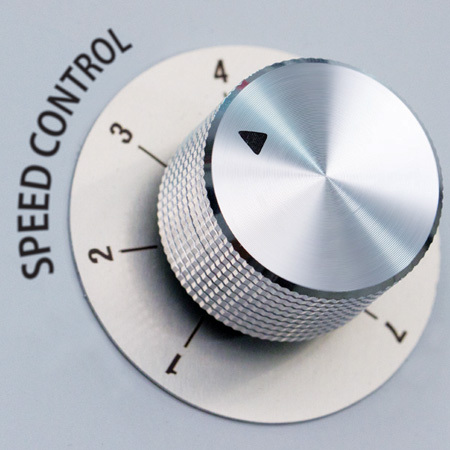 The optimal rotation speed matching to the performed operation step can be adjusted by the stepless speed control, e.g. 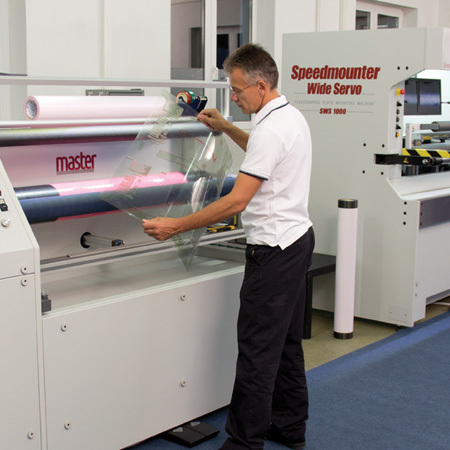 slower speed for the stronger adhesive tape and higher speed for the plate removing. The operator adjusts the speed by the knob of the rotating potentiometer located on the control panel. Pneumatic brake which can be activated at any circumferential position of the air shaft. Suitable to guide adhesive rolls with full face width or shorter. Easy and very fast use. 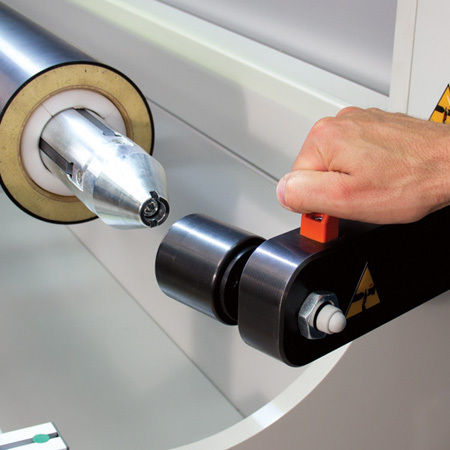 This construction provides alternative to the crosswise application of the adhesive tape used by flexo printers. No need adapters or other preparation for fixing the adhesive tape roll: the roll should be placed simply onto the roll holder. After placing the tape applying can be started immediately. Pneumatically moved unit guided by precise linear rail with integrated LED lights line. 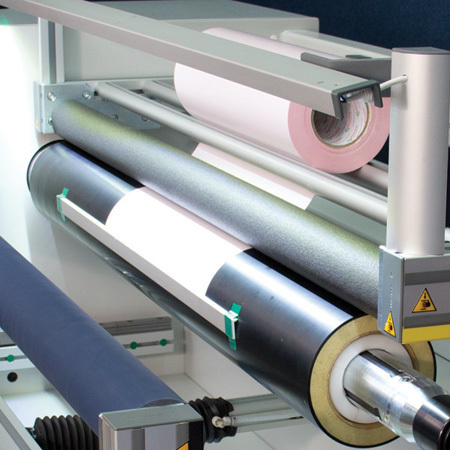 The pneumatic lay-down roll provides equal conditions for every adhesive tape applying operation (sleeve rotation speed, pressure) so the tape applying cycle is fully standardized. The coating of the dia. 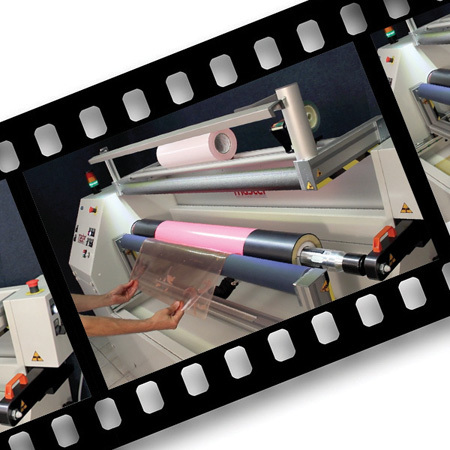 70 mm lay-down roll is soft polyfoam. The working area is lit by high brightness LED with natural colour temperature built in the aluminium profile. The crosswise applying of the double sided adhesive is fast and easy. Lightweight, wearless flexible opening adapter made from danamid allows using sleeves with diameter different from the diameter of the air shaft. The simply designed adapters are changeable within seconds. The thick wall adapters are manufactured in a compact form namely in one piece for further reduction of the adapter change time. Manufacturing of the adapters executed according to the sizes of sleeve sets used by the printing house. The cut edge will be perfectly free of any gap. Avoids sleeves for damages by cutting the adhesive tape. Thank you for your interest about Master DeMounter & Tape Mounter machine.